To best prepare for the future, the HIM profession must begin to expand its educational opportunities to include new competencies. Excluding management, an examination of the job hierarchy in a traditional HIM department would find the most skilled—and, consequently, the most highly reimbursed—positions in the coding and auditing section, followed closely by the transcription sector. The tasks associated with actual records management would be found near the bottom of the heap and subsequently more poorly paid. The HIM program graduates who are the least inclined to pursue careers in coding or transcription would only find reasonable salaries in actual document and records management by becoming managers of the HIM team’s lesser skilled employees. These general managers, often highly skilled in hard copy records management, have found themselves farther and farther down the esteem scale as the evolution toward electronic health records (EHRs) has gained momentum. Indeed, the general consensus in the healthcare world has been that the EHR would save healthcare dollars through the elimination of HIM records management jobs or the conversion of such jobs to relatively unskilled scanning coordinator management positions. How did coding come to dominate the HIM profession? Numerous forces have influenced its rise to prominence. Prior to the arrival of prospective payment in the early 1980s, coding was conducted to create the disease, operative, and physician indices employed by physicians and other specialists to carry out medical research. Frequently neglected and understaffed, coding was often done months after the actual patient encounters. Attaching coding to healthcare reimbursement revolutionized HIM, resulting in more attention and recognition and therefore higher salaries. Simultaneous to the reimbursement impact, healthcare upper management became interested in the development of data warehouses and decision support systems, systems designed to collect discrete, structured data into large databases from which strategic planning and forecasting decisions could be made. A key feed to any data warehouse system is coded data extracted as a by-product of the claims submission process. As a result, coding data became a prominent influence for organizational planning and reimbursement. The integrity of coded data became important in ways that were never encountered when it was performed simply to create indices. Several regulatory, technological, and cost-control movements are about to upend the primacy of coding competencies in the HIM pyramid. 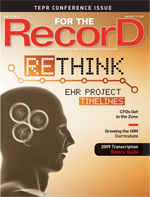 Although coding will continue to be a force in the HIM environment—particularly with ICD-10 on the horizon—computer technology has advanced to the point that it’s now possible to review the clinical content of healthcare records and provide suggestions for more routine coding, especially in the outpatient domain. Many electronic ambulatory record systems offer basic coding support to help physicians self-code as they document. There will still exist a need for expert HIM skills to oversee the accuracy and integrity of these systems, but coded, structured information will increasingly become computer generated. Meanwhile, many of the companies offering document management systems as part of EHR solutions have found other clients in industries such as manufacturing and power generation who were equally anxious to automate mountains of unmanageable paper content. Legislative actions such as the Sarbanes-Oxley Act and the December 1, 2006, amendments to the Federal Rules of Civil Procedure put records management back into the spotlight, resurrecting its proficiencies from the reluctantly tolerated corner to a hot ticket set of in-demand skills and marketable experience. Last, but not least, the ability to manage costs and reduce expenses has never been more critical in healthcare. A professional with the gift to manage hundreds of thousands of records and millions of documents with drastically less, yet more skilled staff is now imperative to have on board. An examination of the identified domains of managing unstructured (noncoded) information will look familiar to HIM professionals, many of whom may possess some of the skill sets required to manage evolving content management systems (see Figure A). Organizations are now investing in people who can guide the creation of documents in a templated, standardized, and retrievable manner. Not unlike the familiar HIM transcriptionist, these document management specialists are adept at helping people take free-form speech and ideas and translate them into standardized, formatted content recognizable to others in their organizations. Like transcriptionists, these emerging employees have superior reading, writing, and communication skills and are proficient at transforming the native format of files through Adobe Acrobat and other types of systems. Skilled at using graphical software, these specialists can support their constituents’ needs to lead through pictures, as well as words. Mechel McKinney, BS, RHIA, program director of HIT at Central New Mexico Community College, has reviewed the AHIMA domains and says students must cover many of the basic reading and writing skills prior to even entering the program. She emphasizes that in the school’s two-year program, a student “must learn how what he or she does fits into everything else and how that individual’s performance impacts everyone else.” Programs supporting four-year degrees in HIM must soon refocus to ensure that all graduates emerge with superior document creation skills. In that regard, the Association of Records Managers and Administrators and the Association for Information and Image Management have already aggressively moved forward in retraining hard copy records managers for this new paradigm. In the future, technical writing and document creation must be part of tested HIM competencies. A weakness of many online HIM programs is the confinement of testing to optically read multiple choice or true/false answers. Although more time consuming for the professor, demanding essay-style answers may result in graduates who are better suited to content management jobs. Document organization skills, particularly the development of indexing for the scanning of hard copy documents into electronic medical record (EMR) systems, is a growing HIM competency set. Taxonomy development is something more familiar to master’s of library science programs, but it needs to soon become part of HIM bachelor- or master-level competencies. To escape being trapped behind strictly medical record walls, members of the HIM field need to examine how all documents and records in their organizations might be indexed and organized. This means surrendering the familiar niche of medical record expert to move out into the organization and support management of more diverse content. Most HIM programs introduced computer technology competencies some time ago. McKinney notes that HIT students receive a solid grounding in the basics of computer functionality, including Excel, Access, Visio, and even project management concepts. Nevertheless, the burner on these program domains must be drastically raised. Unfortunately, current curriculums stress information systems primarily in the familiar context of supporting an EMR or related technology, such as clinical decision support systems. Management of enterprise master patient index, billing, and registry systems also come under brief review. These systems all capture and manage primarily structured information, which constitutes about 20% of an organization’s total. What new skills in the management of unstructured information could revamped HIM curriculums offer emerging RHIAs or new information management master’s degree-level professionals? Certainly taxonomy development must be introduced. In addition, a working knowledge of collaboration technologies, including workflow development, management, and execution, should be part of every graduate’s skill set. Most HIM educational programs have moved rapidly to an electronic environment that includes discussion boards, online voting, and group or team projects accomplished electronically. • construct quality management indicators about the scanning process’s accuracy. Document capture could also include documentation of source systems external to the core EMR systems and whether such source systems will retain their legal documents or whether storage will be redundant in the EMR as the legal record repository. The presentation of documents has a certain glitz if it is associated with how a healthcare organization presents its face to the world. Large sums of money are dispersed to companies specializing in Web content management, a branch of enterprise content management. The design of the organization’s Web face can have competitive advantages in a marketplace of narrow margins. It is also how the organization interfaces with its customers. Designing the Web pages and working with the document owners to help them put their content online is not an especially different skill set than forms creation and management, a skill set quite familiar to HIM professionals. In fact, HIM often chairs the committees that structure, create, and archive the forms and templates required to maintain an easily documentable EMR. Development of forms management skills is a tiny part of the current HIM curriculum but could be expanded to include development and/or management of Web content pages. Those moving toward work in HIM consulting would find it useful to know how to create a Web site and manage its contents. Certainly in a bachelor- or master-level program, understanding Web documents and how their management relates to records management would be valuable. Maintaining documents whether housed on the Web or in an electronic library means understanding versioning management (ie, keeping track of the different formats and versions of documents and records over time). By developing the EMR, some HIM staff have developed an understanding of this skill. With the routine turnover of computer systems and software, a comprehension of versioning management should be a part of basic information systems curriculum. Document retrieval skills are connected to how well the organizational taxonomy was developed in the first phases of a content management system implementation. A small subset of HIM professionals has specialized in working with administrative decision support in which query development is a handy skill to have. Most HIM professionals at all levels are familiar with Access database development and the ability to build simple queries from such systems. The ability to query large archives of unstructured documents and records does require query development skills, but the result is highly dependent on how well the taxonomy was built and how tightly metadata have been attached to documents and records as they are entered into the content management system. Audit skills acquired through an HIM education can be applied to monitoring the success of database searches and applied to making systems more iterative to improve the accuracy of searches across thousands of records and millions of documents. Ramping up the portion of the HIM curriculum focused on legal and regulatory matters is absolutely critical. Too often, HIM legal classes are targeted predominantly at coding-directed students interested primarily in fraud and abuse legislation; HIPAA is usually addressed mostly from a privacy perspective. The content taught at the two-year credential level will not sustain a records management professional trying to enter a large content management development. The future professional must thoroughly “get” retention management over multiple records on multimedia. Legislation such as Sarbanes-Oxley and the Federal Rules of Civil Procedure amendments must be thoroughly taught with an understanding of their records management implications. Electronic signature policy must be developed with out-of-the-box thinking (ie, leaving a strictly EMR focus behind and determining that signature management must be handled over multiple platforms and signature records may have retention guidelines of their own). In addition, the new records management curriculum must train members of the HIM field in the basics of electronic storage management and the methods information systems professionals use to manage the information load on systems. A records manager must certainly participate in decisions concerning e-mail management and whether certain e-mails must be declared records and managed as such. Other types of records, such as those that might be created through instant messaging, must also be considered. Lastly, HIM leaders must step up and learn more about information security. The cursory knowledge most HIM personnel have regarding HIPAA security, the Federal Rules of Civil Procedure, etc must be addressed. As organizations consider hosting personal health records and participating in health information exchanges, HIM professionals must become experts in these areas in order to advise their organizations on the correct directions to pursue. The competencies examined in this article present challenges to HIM students and to the professors committed to getting them ready for the future. The happy news is that the future is there waiting for the educated and the prepared.